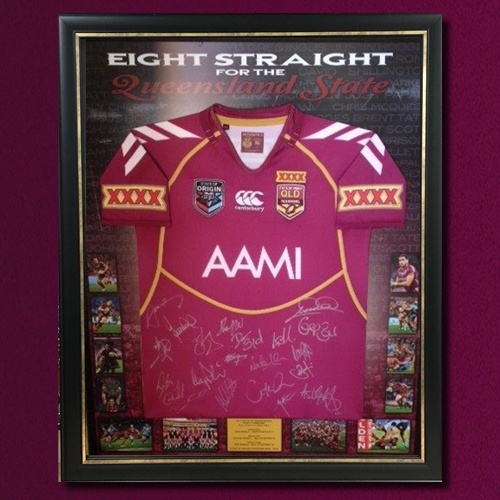 This Queensland State of Origin Jersey has been personally hand signed by the 2013 Queensland State of Origin team. In 2013, the Queensland Maroons stretched their unbeaten run to an unprecedented eight straight series wins. The 2013 State of Origin series saw two games played in New South Wales and one in Queensland. Queensland were underdogs after losing the first game in Sydney however, were able to convincingly even the series on their home soil before taking out the series in Sydney by two points to retain the shield for the eighth year in a row. This rare piece of sporting memorabilia is framed and complete with a number of photos capturing defining moments from the 2013 State of Origin Series. As Queensland continues their dominance, this piece is set to be a collector’s item.